This is one of those books I was excited to get but half-expected to leave on my shelf. It wasn’t until I had to read it for the Dr Johnson’s House Reading Circle that I actually picked it up and read it. 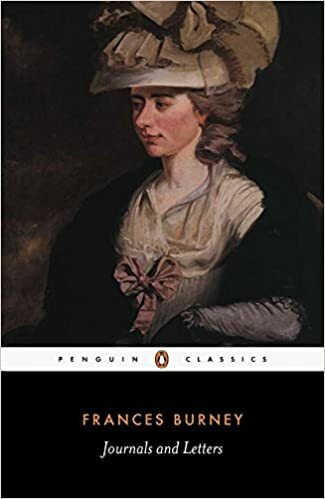 I was expecting to find Frances Burney to be affected and a little irritating, having read a biography of her and come across in many places since. I was worried at first. Frances is young, names her journal ‘nobody’ as she has nobody to tell her secrets. She complains about being dragged to meet boring strangers (which was worse with her crippling shyness.) There’s another entry where she talks about how she wants to love without being loved back. It’s all very gauche. How surprised was I, that I was utterly on her side in a few pages. Things pick up as she starts writing ‘Evelina’. The novel was written in secret as she was terrified of being exposed as a boastful ‘scribbler’ and paranoid about her father’s disapproval. She claimed she had it published on a whim (something I don’t believe for a second) but she was genuinely surprised when it became the talk of the literary world. Her father was a music historian who was a member of The Club, a group of polymaths surrounding Samuel Johnson and she was often with him as his secretary. She thrilled at hearing these huge names talking about her little book, though mortified when it was eventually pinned to her. From then on she moved in those circles in her own right, becoming a virtual pet to Hester Thrale. The journals/letters are full of little pen portraits of great eighteenth century figures. Two of my favourites were poor, pathetic Kit Smart after being released from the madhouse, Davey Garrick sweeping into the house and charming the pants off everyone. Some of these are wonderfully niche, her brother travelled Cook’s last two voyages and so she became loose friends with Omai, a traveller from Tahiti. So many of these sketches are vivd and wonderful because she has an almost pitch-perfect ear for how people spoke. While her visual and behavioural descriptions of people follow some pretty ordinary 18th century phrasings and forms, her ability to create a real voice is astounding. Whether it is King George III’s little tag phrases (“what, what”), Paoli’s peculiar manipulation of English (“I was a baby to him”) or an Irish peer’s odd, scattered chat (“boys here, boys there, boys all over”). She manages to bring the people into the room. Interestingly, she also has Johnson starting many of his utterances with a barked ‘sir’, so it wasn’t just Boswell’s affectation. (Incidentally, she avoids Boswell because of his own listening ear and ready notebook). Following the success of ‘Evelina’ she was invited into the court of Queen Caroline. She was there for five years and appeared to have hated most of it. For someone who was overly (even sensitively) keen on propriety, she has an inner streak of independence that won’t be contained by court life. As usual, her snippets of court personalities are full of vigour- George III is full of energy and life, perhaps even more so during one his ‘mad’ periods where he chases her around the gardens of Windsor. Released from court, she finished the book ‘Cecilia’. I loved hearing her friends discussing it, how one managed to read it four times whilst Sir Joshua Reynold’s was still on the first volume. The best part was when she met Mrs Delaney and the Duchess of Portland. They gossip about the characters as if they are friends and (thrillingly for me) describe Richardson’s ‘Clarissa’ as long and boring. Then she fell in love with Alexandre D’Arblay, a penniless emigre from the French Revolution. Using her court pension and the sales of her third novel, ‘Camilla’, she lived in a little cottage where she had a son. In the lull between Anglo-French wars, the three of them went to visit family in France and were subsequently trapped in Napoleon’s France for ten years. She suffered a mastectomy without anaesthesia, reported on the effect of Waterloo from Brussels and moved back to England. As she grew older she lost family members (including her father, husband and son), sorted through her father’s next to useless memoirs, wrote another novel and got trapped in a cave filling with sea-water. Then she died, aged 87. As keenly as she views other people, she seems a little oblivious about herself. From youth to old age, she is always painting herself as a trembling, shy, physcially delicate person. This is the same woman who wrote sharp depictions of all those around her, survived a hideously painful operation and the rigours of the Napoleonic wars as a British woman in France. She almost lived to her nineties - she was no delicate flower, she had a will of steel. I wish she could see herself with the same clarity she saw everyone else. One of the strangest things about reading Frances Burney’s journals and private letters is knowing how mortified she would be that I was reading them. This is a book I would highly recommend, there are so many small and incidental details that were fascinating. We get to really hear Johnson at his most frighteningly vitriolic and his most tender. We are trapped in the stuffy court where she spends the long evenings looking at coffee because she doesn’t like to drink it. We get gossip about people with big noses, Corsican generals meeting Irish Giants and Tahitian adventurers eying up beautiful women in Hyde Park… and so much more.